Intertops Poker and Juicy Stakes get another chance to win their way to the Caribbean this month! 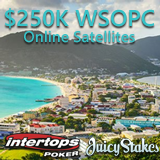 Online satellites for the $250,000 WSOPC tournament in St Maarten begin today and continue until the Final on August 13th when the $3375 prize package will be awarded. As well as enjoying the lavish hotel and all-inclusive dining and beverages during a five-night stay for two, the winner will also get a $1675 buy-in for the World Series of Poker Circuit $250,000 GTD Main Event on November 11. Daily online satellite tournaments continue until August 13, 2017. The path to St. Maarten begins this week with daily tournaments. You can enter Step 1 for $3+$0.30 and work your way through, or enter at Step 2 or Last Chance and try to qualify directly for the Final. “This really is a competition that will change lives,” says the head of Intertops Poker. “We are so excited to get this event under way, and especially looking forward to the final, where one player will score that amazing trip the Caribbean." Tournament details are available at Intertops Poker and Juicy Stakes. August is a Month of Romance at Slots Capital Casino. This month the casino, which specializes in online slots from Rival Gaming, is offering a series of romantic bonuses, special offers and free spins on some of its most popular casino games. From August 1-4, enjoy a 100% bonus and 100 free spins on the very aptly named slot For Love and Money. To qualify for the bonus, deposit at least $40 and enter the code ‘ROMANCE’. Your free spins will be active for seven days after being claimed. Bonuses, special offers and free spins on popular games from Rival Gaming available through August. Then, from August 5-10, it’s time to celebrate with a 300% bonus on deposits between $35 and $500. Input the code ‘Retro Party’ to activate the offer. On August 9 Slots Capital, will celebrate South Africa National Women’s Day in style by offering 20 free spins on Lions Roar. The offer is only open to players in South Africa, with the special code of ‘SAND’. August 9 is also Singapore National Day and Slots Capital will join in this year’s celebrations by gifting players in the country 20 free spins on Rise of Poseidon. Enter the code ‘SGPND” to claim the bonus. The Month of Romance continues from August 11-23 when you can claim 30 free spins on Ten Suns. Customers simply make a deposit of $25 and enter the special code ‘LAZY DAY’ to access the offer. Slots Capital will end the month in style by offering a bonus of 100%, plus an extra $100 on top, for customers playing slots from August 24-31.